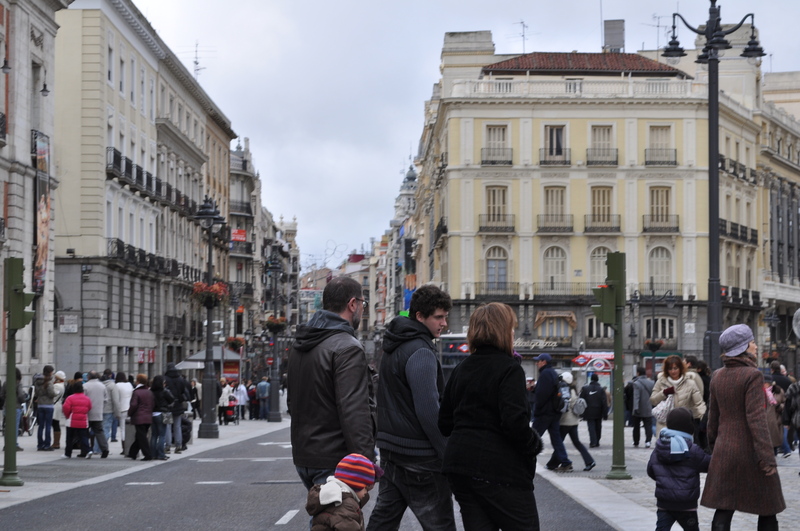 Day two we finally got a break from the constant rain and we were quick to make our way to the center of town to take some pictures, eat some food, and see some sites in the Spanish capital. 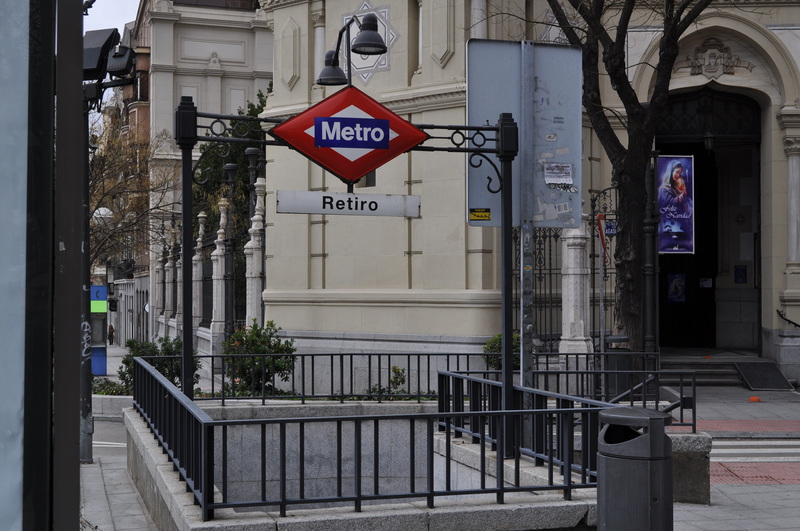 The Metro system in Madrid was very nice. The lines that we took around town were clean, efficient and we never waited for more than 5 minutes for a train. Even on Sunday. 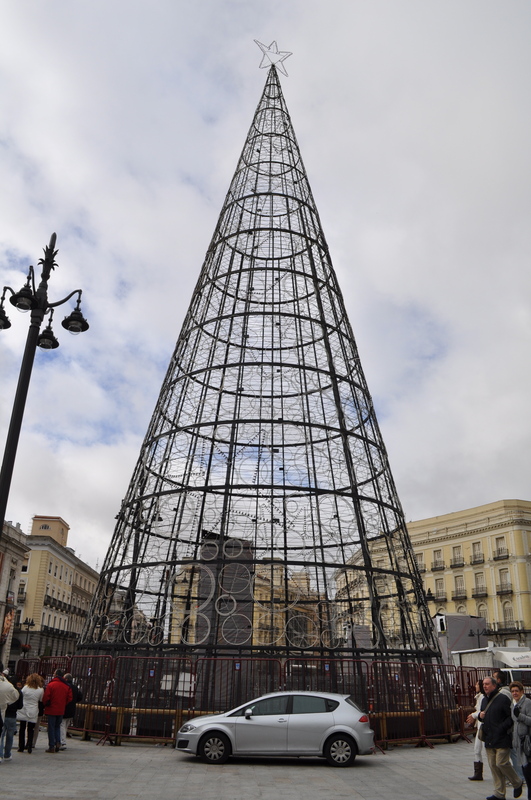 On New Year’s Day we headed to the The Puerta del Sol (Gate of the Sun) which is one of the most famous spots in Madrid and home of Spain’s km 0. 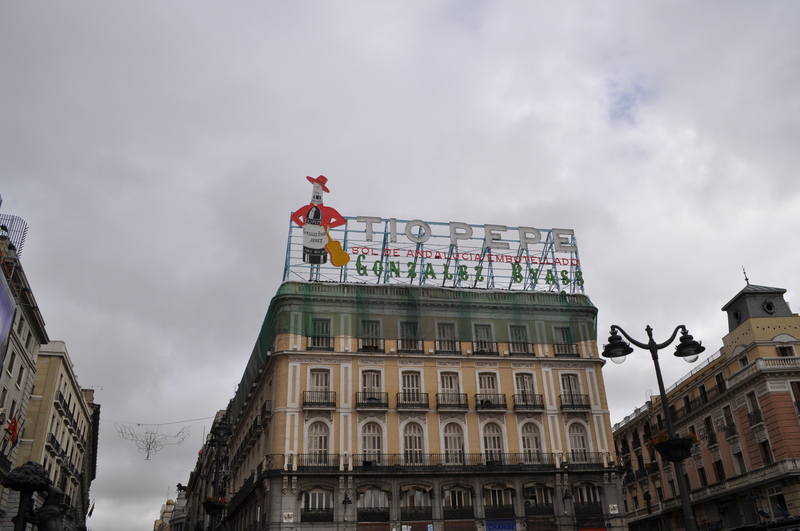 I loved the Tío Pepe sign. 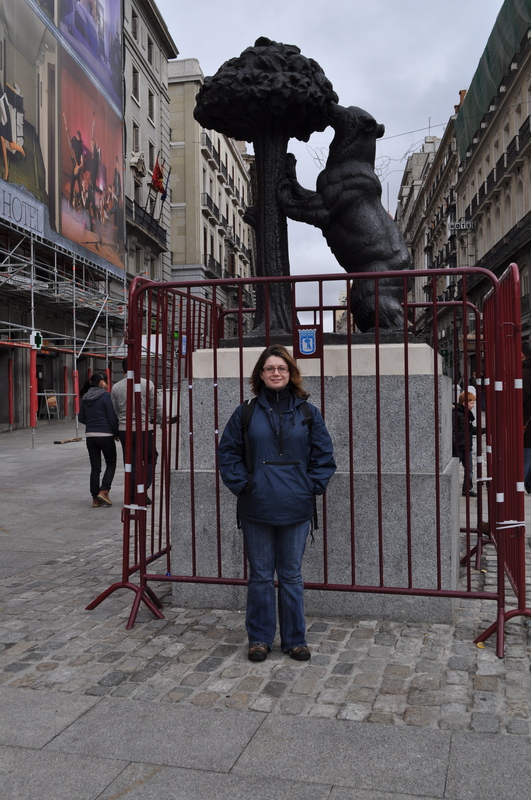 We waited for a few other people to snap their pictures, before getting one with Györgyi and the Bear and the Madroño Tree, which is the symbol of Madrid. It was gated off, which I don’t think it is usually, but the night before the big New Year’s Eve celebration was held in that square and probably they wanted to protect it from the revelers. The plaza was packed. Seriously packed with tourists, despite the cloud cover and occasional spitting rain. 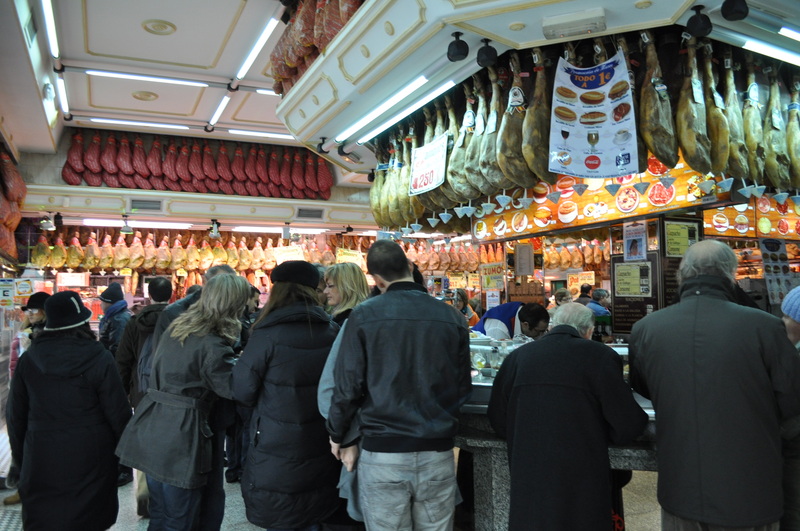 Everyone was out shopping and eating, which seems to be the most popular activities in Madrid. I’m not complaining. 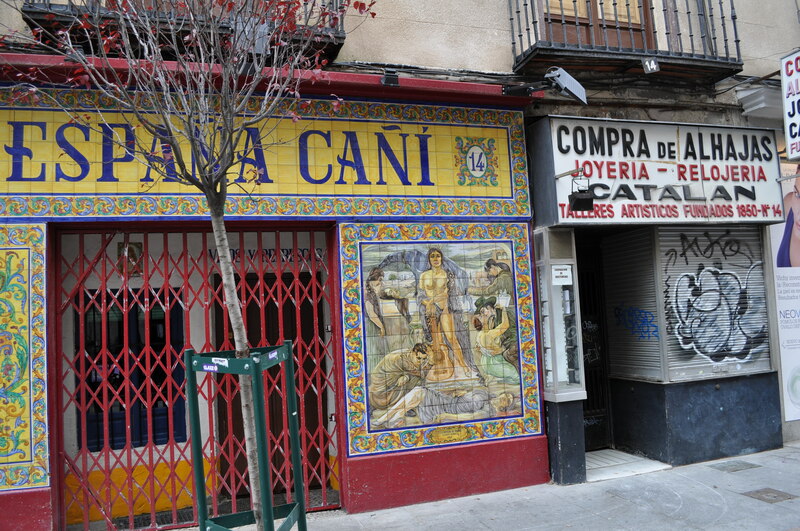 The area was a really interesting blend of tourism, modern Spain, Old Europe buildings and of course European classics: Loaves upon loaves of bread being delivered to alleyway shops. 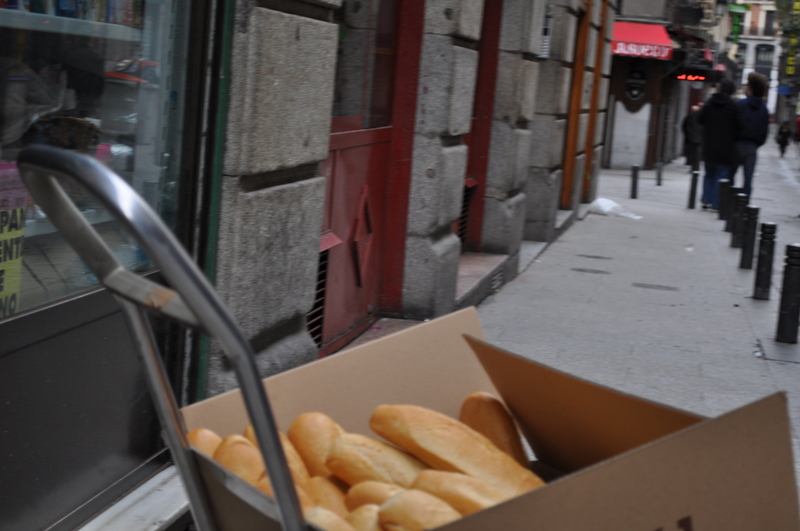 When we saw the bread we knew it was a sign to start looking for something to eat for lunch. 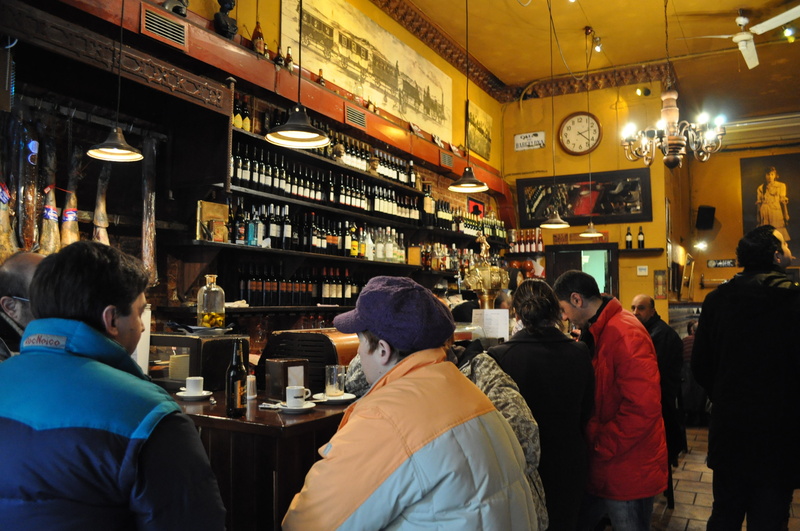 And it seems everyone else had the same idea because every little joint and tapas bar that we went into was packed. 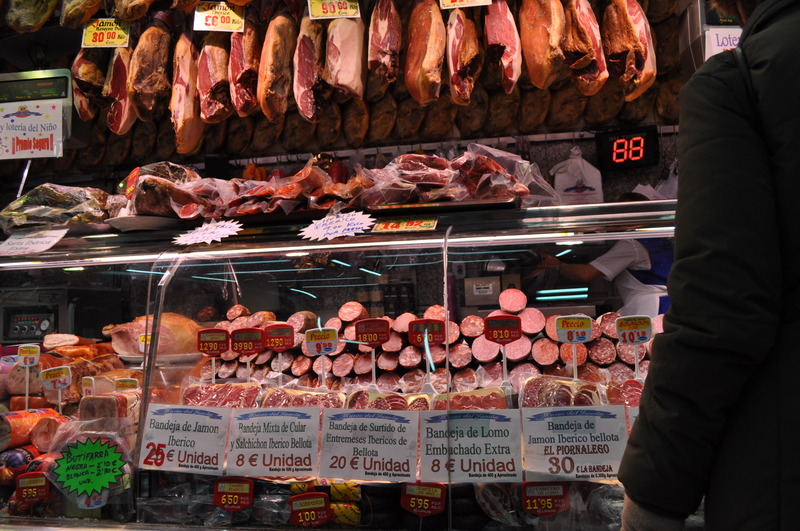 I took these pictures in a butchery/sandwich shop/tapas bar. There is something so beautiful about this meat. 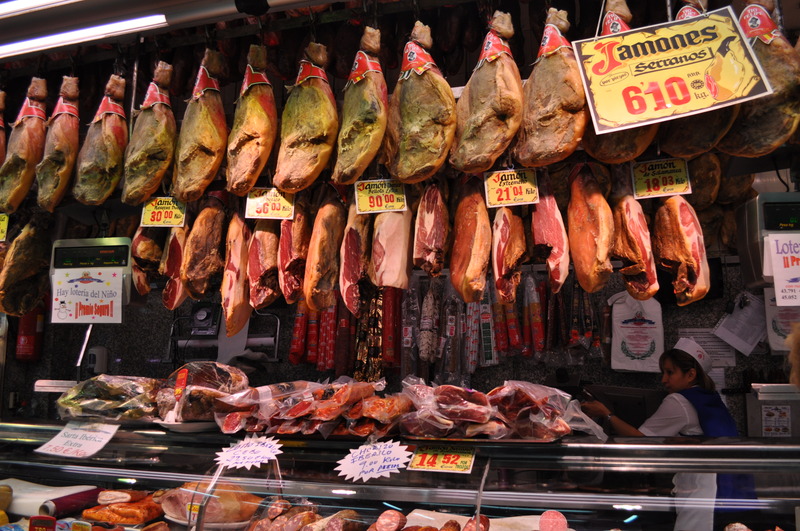 I’m not a really serious meat-eater, but the rows of these drying hung hams were just inspiring! 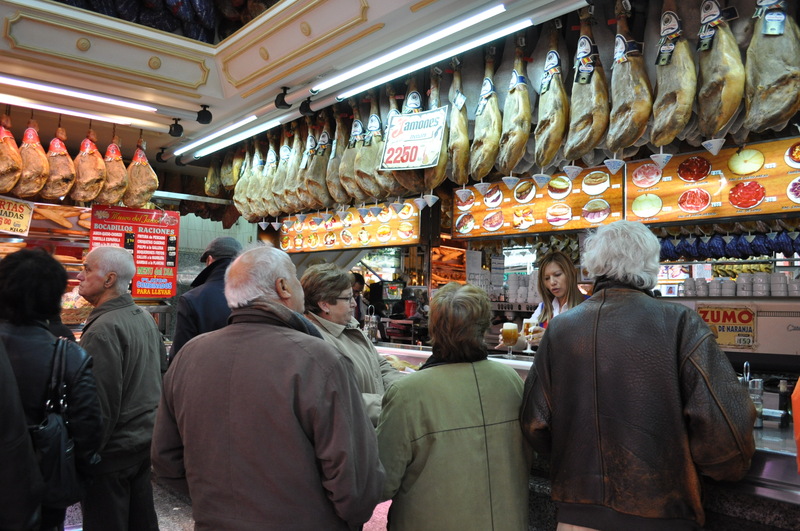 I also adore the Spanish food culture. Especially the small-bites mentality. A few little lunch items, a small beer or wine, and then a walk (or nap) before going back out for an evening stroll and late dinner. 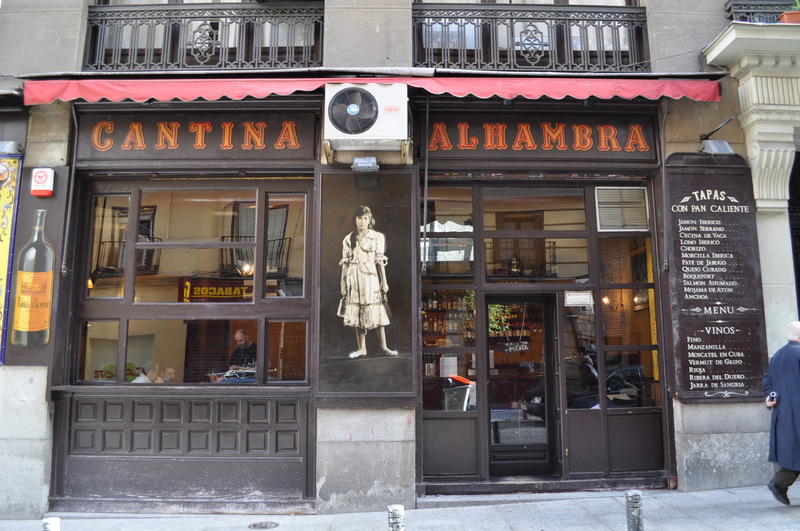 We sat down at Taberna Hambra. 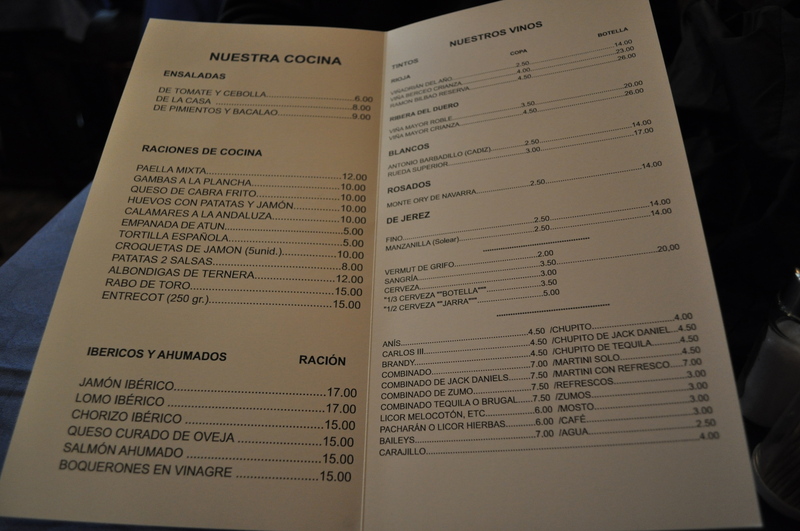 For you Spanish-speakers, you can see the menu options. The prices (in Euros) were pretty standard for most of the tabernas in town. So. 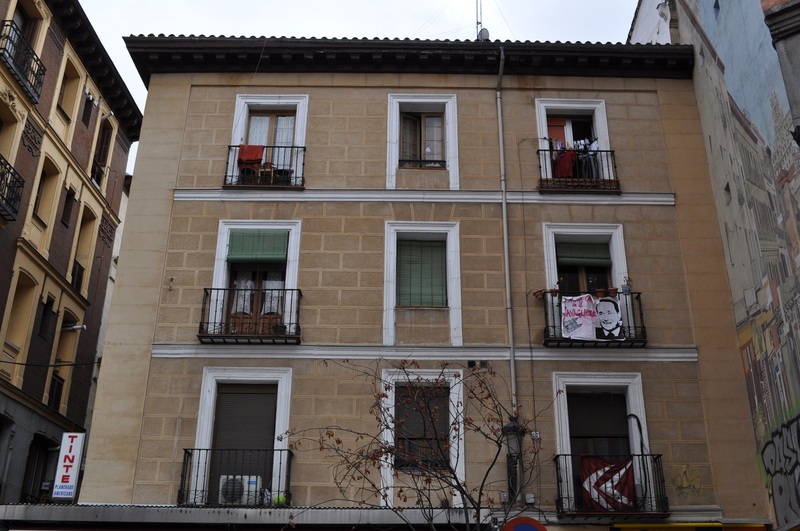 From the top left. The free bread for the table. Györgyi was particularly amazed by this gratis bread, especially since free anything is practically unheard of in Hungary. (When the server at El Campensino in America refilled our tortilla chips and salsa she looked as if she had seen the face of God.) So, bread. 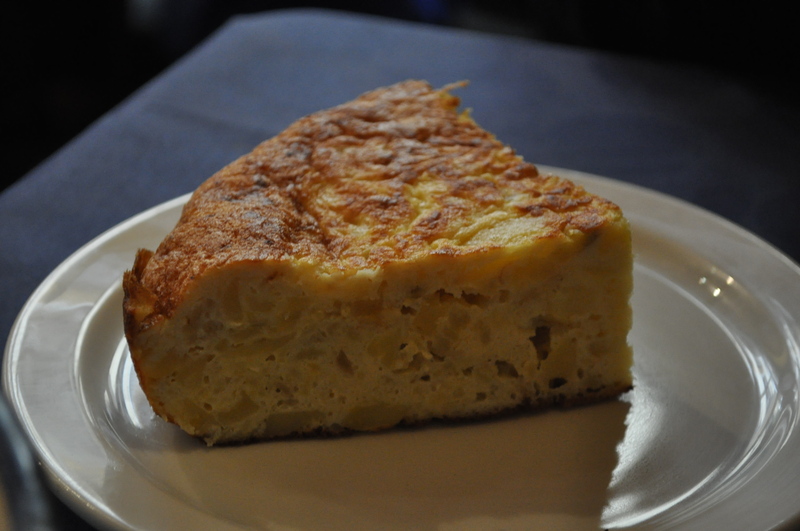 We both split/tasted the Tortilla Espanola, which was essentially a large cake of potato, onion, cheese and egg. 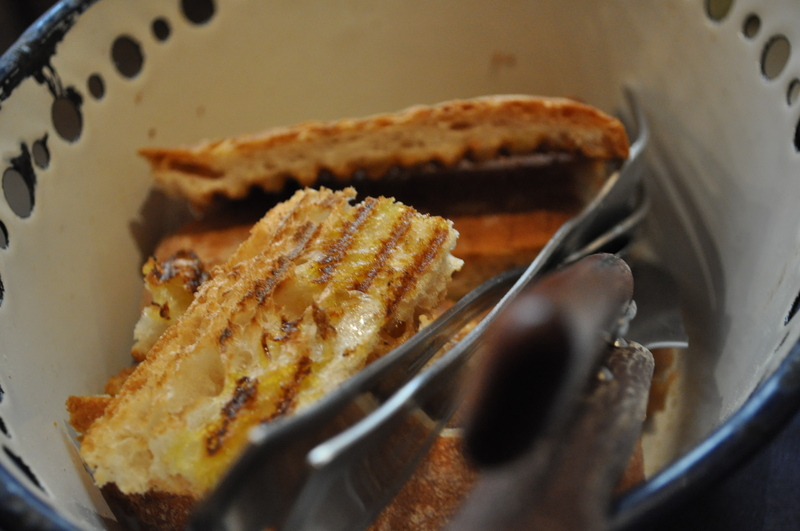 Very very delicious. 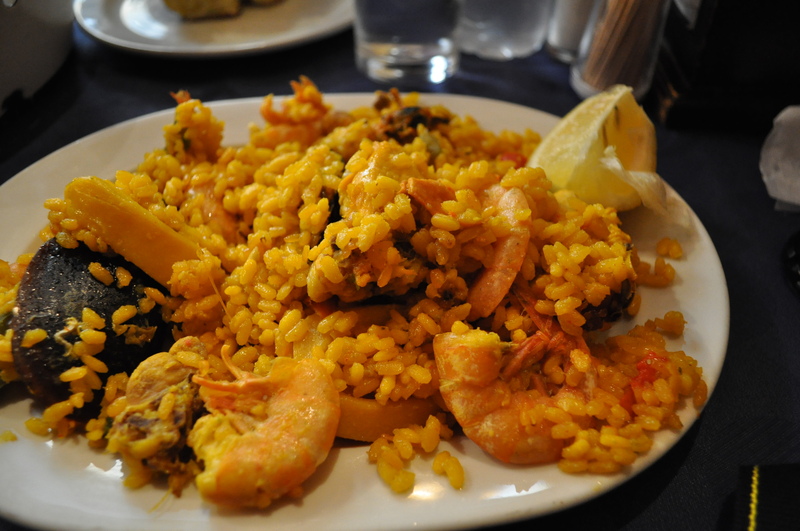 I had the paella, which was so wonderful, and one of the two things I wanted to eat in Madrid. Saffron flavored goodness with shrimp, mussels, clams and squid. 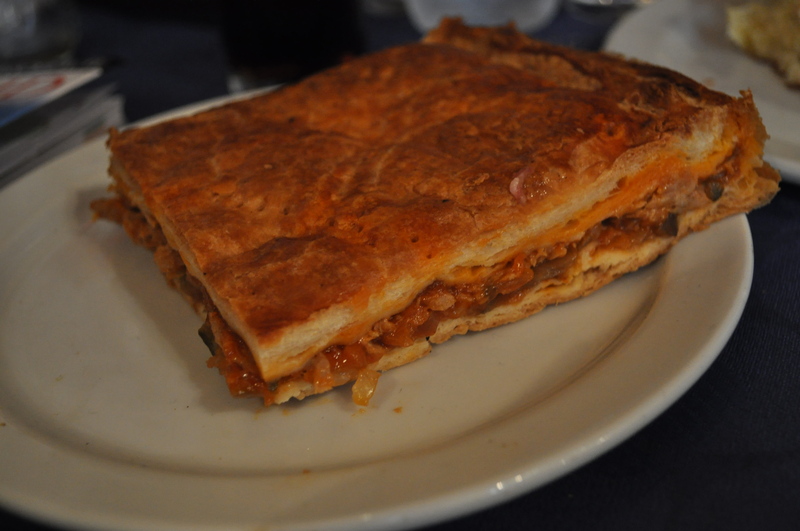 And finally Györgyi had an empanada with tuna. 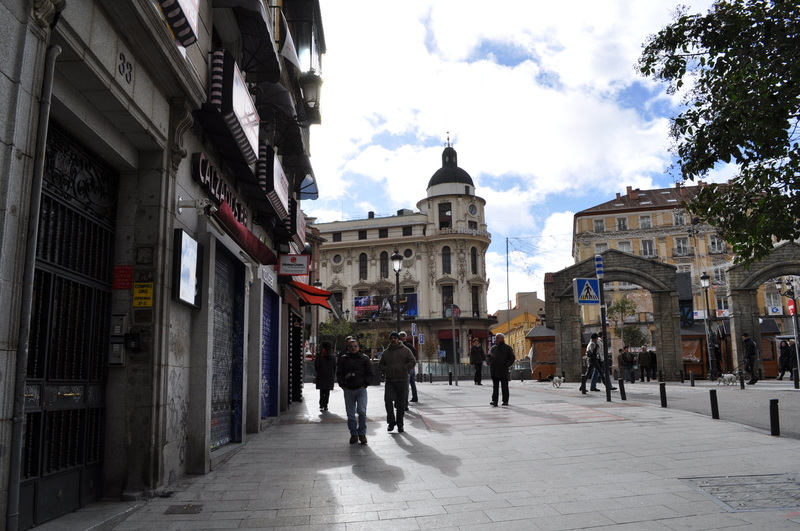 As afternoon dragged toward evening we walked through town and down the Grand Via. 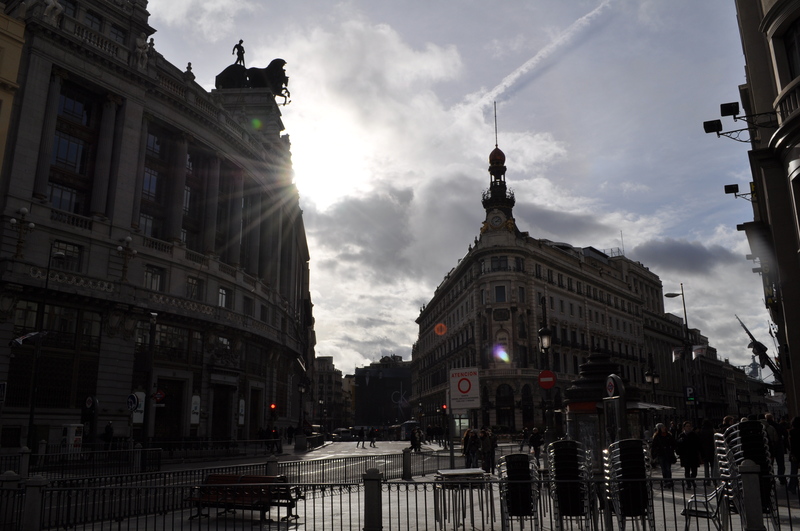 The sun was trying her hardest, but eventually the clouds wandered back into the city center so we headed to our hotel to rest before dinner. 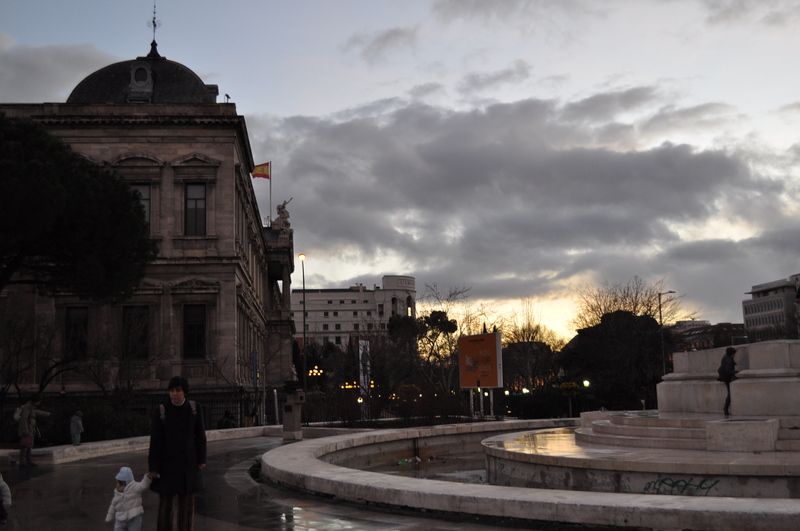 As we walked to dinner, we passed the monument for Christopher Columbus. The light that evening was incredible. 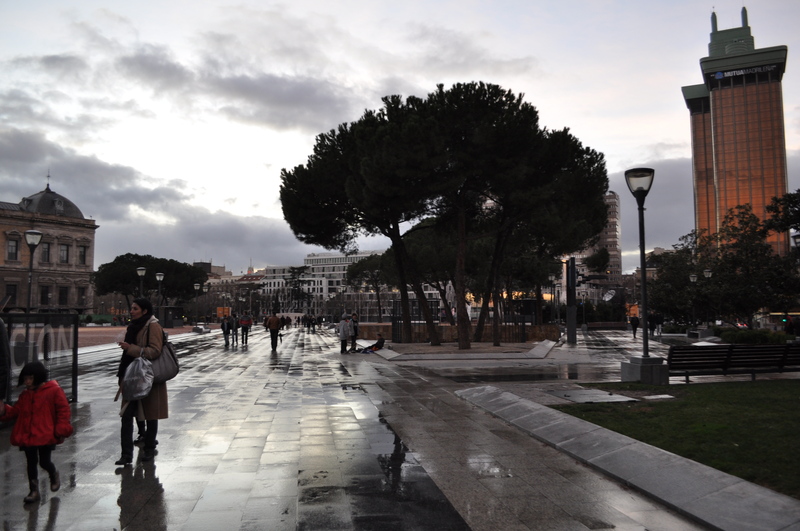 And despite the on and off again rain, people were really out and walking everywhere. 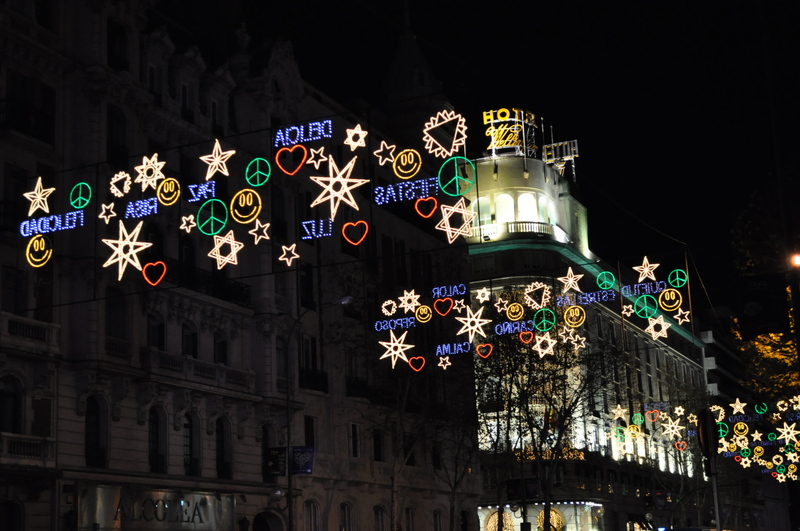 This is a ritual throughout Europe, and one that I wish Americans would adopt. It’s relaxing, not to mention good for health. We didn’t stay out much later than to eat dinner, though we did catch the sunset around the fountains before we ate. I always have a much harder time adjusting to the jet lag coming back to Europe than going to America, especially because I can’t sleep on the plane. So we went back to the hotel a little earlier than usual to rest. 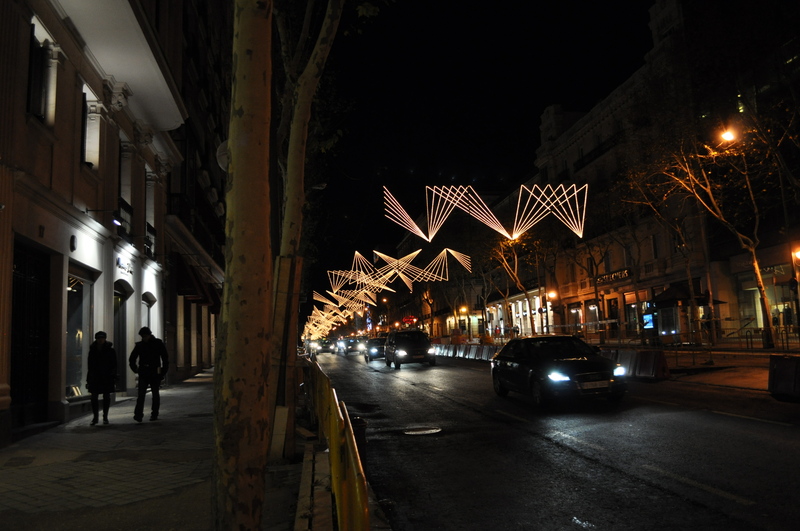 The way back was lit by all of the holiday lights. 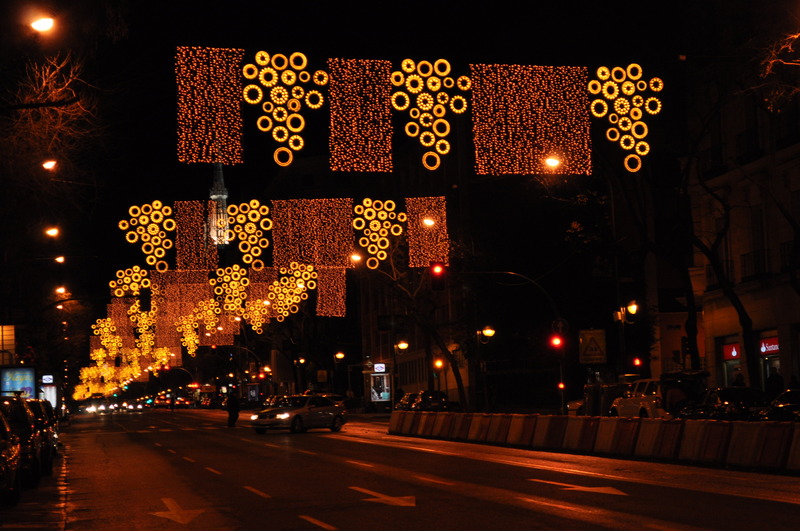 Each street in our neighborhood had a different set of lights running from end to end. 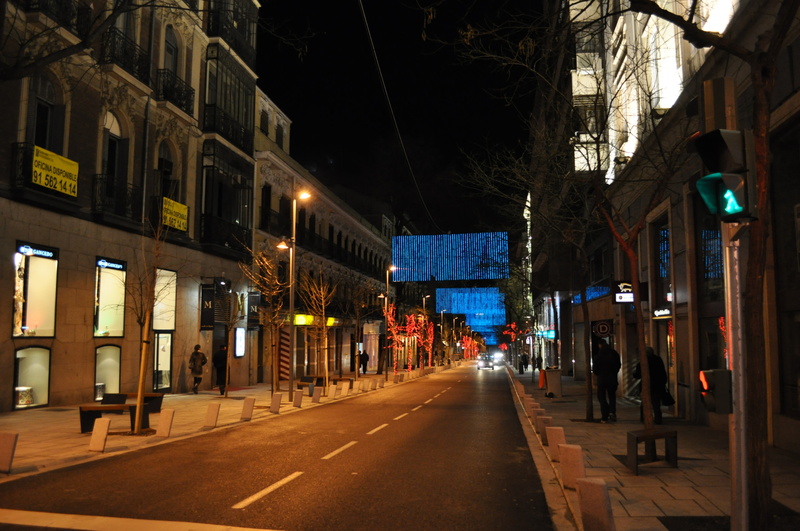 Not only was it beautiful, but it made figuring out the streets very easy, especially at night. It was a nice and restful way to spend New Year’s day. 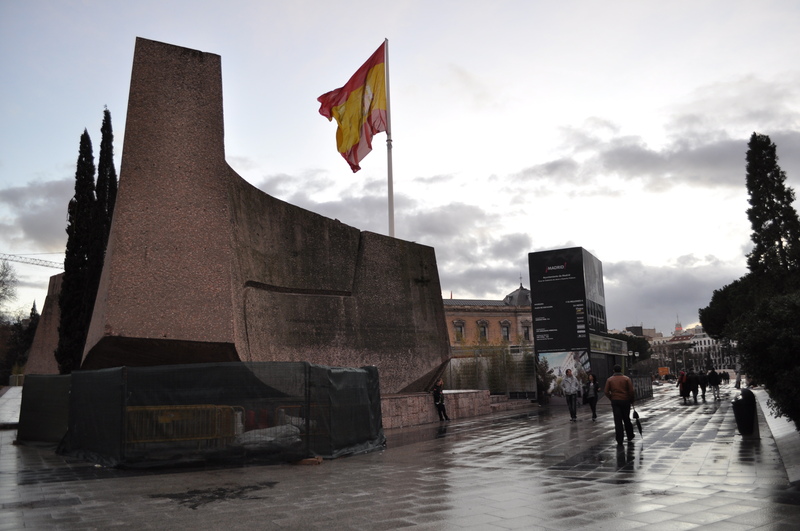 We were fully prepared for the following day and our marathon of museums and tapas. Great photography Jessica. Your new camera is stupendous!! And of course you. This is your mother.